Ferrari's latest creation: A sweeeet shooting break flagship with 4wd and 4 seats! 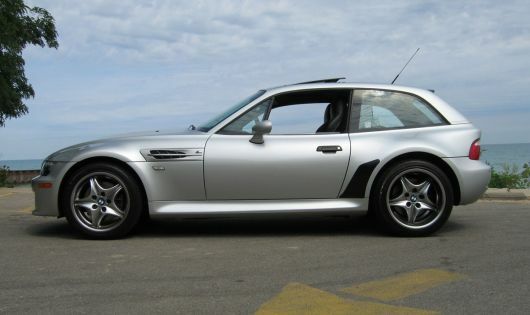 Looks like a Z3 M Coupe 10 years ago. the front looks great in the pictures, and the rear looks like an M coupe. AWD seems odd for a Ferrari... but I look forward o seeing it. Seems that PF is no longer going to be associated with Ferrari design, sadly. it only looks like a Z3M coupe because that's the only 2 door estate car you can think of. Looks like a Reliant Scimitar as well? If it were a coupe it couldn't have the headroom for the rear passengers. also the first 'FF' was a Jensen, it stood for formula Ferguson. The first four wheel drive sports car. The side profile is fairly similar... Obviously the proportions on the Ferrari are significantly larger, and it isn't a copy. Definitely influenced by the M coupe. The wheels aren't a million miles away but if you look at the rear shoulder line it's very different, the rear window shadow is different, it doesn't have quarterlights, I think that the Z3m is just so much more upright. This one's even the same colour!! !